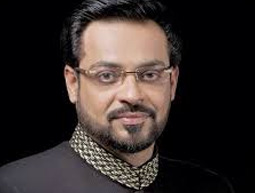 A Muslim scholar, TV host, and a socialist Amir Liaquat Hussain need no introduction. He is now a household name in Pakistan. Aamir Liaquat Hussain was a great Muslim scholar. He was born in July 5, 1971 in Karachi, Pakistan, is the former Pakistani minister of state for religious affairs. He is the son of Sheikh Liaquat Hussain and Begum Mehmooda Sultana who, like himself, was active politicians. Aamir Liaquat entered politics in 1988 by joining the All Pakistan Mohajir Students Organization. Amir Liaquat Hussain had a religious mind and he has a great voice in Naats. Listen and free download Naats of Amir Liaquat Hussain. Aamir Liaquat Hussain was a well known Political worker of a Political Party of Pakistan and he was a former State Minister of Pakistan for religious affairs and many other activities, and a Host of Popular TV programme Inaam Ghaar on Geo TV. Dr. Amir Liaquat Hussain gained immense popularity through his humorous and witty style of hosting in the show Inaam Ghar. He also hosts the Morning Show of Geo TV called Subah Pakistan. HamariWeb gives you access to exclusive Amir Liaquat Hussain New Naats collection in video and audio formats. This Ramadan facilitate from the latest collection of Aamir Liaquat Hussain 2017 Naats available online on our page. Some of the popular Amir Liaquat Hussain New Naats include Ya Khuda Iltija Hai, Pakistan Ramazan, Pechaan Ramazan and lot more. You can listen to melodious Naats in the soulful voice of Amir Liaquat Hussain from HamariWeb online. Listen and download Aamir Liaquat Hussain 2017 naat and video Naats with ease.